“Many people think that I’m doing this work for LGBT because I’m gay. Of course not, I’m doing this work because LGBT have the same human rights as everyone else who I have stood up for throughout my life as an activist.” Jeanne Marie Hallacy quotes Aung Myo Min, a friend she has known for more than 20 years. Myo Min is a Burmese human rights activist who was among the student activist groups in the 1980s. Due to his activism and persecuted sexuality, he fled Myanmar to Thailand and lived in self-imposed exile for 24 years. During his exile, Myo worked to promote children's’ rights and LGBT rights. When he was allowed to return to Burma in 2012, he started training people in human rights education, informing the Burmese in general about fundamental human rights. Today, he is a popular public figure in Burma, educating people about how children’s rights and LGBT rights are part of human rights. 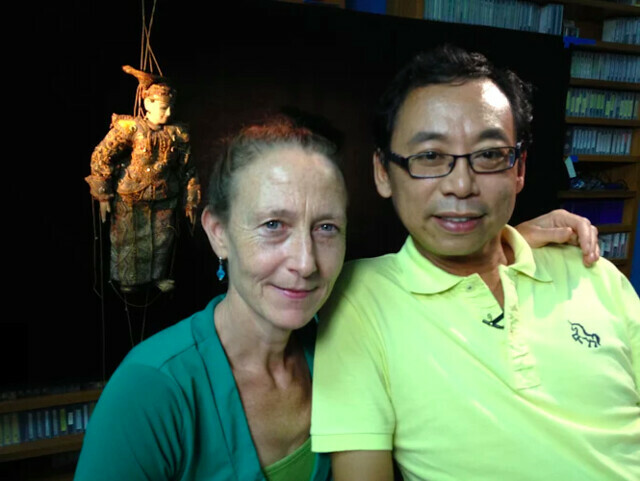 Jeanne Marie Hallacy, the director of This Kind of Love, has been with Myo Min on his entire journey towards Burma’s freedom. She talks to Prachatai about their journey. This Kind of Love will be screened at the ASEAN Film Festival 2015 at 1 and 4 pm on 8-9 August 2015 at the auditorium of Princess Maha Chakri Sirindhorn Anthropology Centre. How did you get to know Aung Myo Min? I’ve known him for more than 20 years. I actually met him when I first came to Thailand in 1992. I began working on the Thailand-Burma border because I was starting to make my other film called “Burma Diary” about young people involved in armed resistance against the Burmese government. I was spending a lot of time in the camps controlled by the Karen and also the student army camp, the ABSDF Army camps. I met Myo when he was still part of the ABSDF Army and I was very, very impressed with him even at our first meeting. Since his English was so good, he was the person who was often assigned to speak with foreign visitors or journalists who came to that area. I noticed that there was something very special about him. He had a kind of passion, a real sense of humour and levity, a lightness about him even in a midst of a serious situation. He was clearly somebody who struck me as a visionary, who understood that achieving democracy and freedom had to be done through multiple means, through all kind of creative means. I think that was what really drew me to him. We became friends. I stayed friends with him over the years after he left the jungle and formed his own organization in Chiang Mai. I kept telling him for 10, 15 years that he should make a film of his story. He would just laugh it off and say, “No no no, I’m so busy here.” Finally, the chance to make the film came, and I’m so glad I could do it after all this time. In some ways, yes. I was deeply involved with the student movement that was in exile in Thailand, as well as in the camps along the Thailand-Burma border. I spent a lot of time in those camps filming and interviewing people, and also in the ethnic areas where the students were living with the ethnic people. I saw struggles that deeply and personally touched me. I felt that their stories were so symbolic in so many ways. Young people could be so determined, and persevere under such incredible hardship, sacrifice, and suffering for their ideals to better their society. It was also particularly sad because, if you remember, the student uprising in Burma was in 1988. Only a year later in 1989 was the infamous Tiananmen massacre when the Chinese students stood up against the Chinese government, with that famous image of the student standing in front of the tank in the square. In fact, a very close friend of mine, who was a journalist living in Beijing at the time and later went to work in Burma with me, said that the students in Beijing took inspiration from the Burmese student movement the year before. That actually catalyzed them to organize themselves. And yet Burma, in the global news and at the global policy level, was much more overlooked than the Tiananmen incident. It was China, so it was put front and centre in the American media. The sheer number of lives lost in 1998 was at least several thousand, primarily students but also monks and civilians who were protesting and killed. Some people put the number as high as five thousand, and at least three thousand were mown down just for peacefully protesting but this did not receive the same level of attention in the international community as Tiananmen did. It was a story that really got under my skin, so I’ve been involved with the story of Burma’s very long and arduous road to opening up for 23 years now. For the benefit of our readers, could you tell us why LGBT is criminalized in Burma? Is it at the social level, institutional level, or both? There are these antiquated laws that still remain on the books in Burma that were put there during the British colonial period. So, these very old British laws are still on the books because the law was never revised. There is an institutional criminalization, but there is also a social taboo which is very deep, rooted in the fact that Burma is a traditional society. Unlike Thailand, Burma has not been exposed to modernization and western values like Thailand has in the last 20 years. It is such a closed society that is far more conservative. For example, throughout Burma you still see women wearing the traditional dress which is the htamain, and men still wear the longyi. In Burma, LGBT was something that has never been publicly acknowledged since there was no space for it in the social sphere, certainly not the political sphere, since it was so repressed. Even saying that the LGBT community existed was repressed since the people were depressed, invisible, and underground, fearful that they’d be arrested. There was an arrest last year in Mandalay just for being transgender. Dressing up as a woman on the street was a criminal charge. This sort of thing takes time to change. And that’s why Myo’s organization, Equality Myanmar, is also working to educate people in human rights training all over the country. He includes LGBT Rights in the context of human rights. It’s Myo’s NGO. Myo is the founder and director of two NGOs. He started the first during his exile in Thailand in Chiang Mai, and it’s called HREIB (Human Rights Education Institution of Burma). Their website is www.hreib.com . During his exile, Myo thought about what was the most effective, long term way to contribute to change in his country. How could he organize people, not just the people in cities or universities but the general population? He realized that he couldn’t organize them to stand up for their rights if they didn’t even know what those rights are, if they don’t even know the definition of human rights, or the fact that there is a universal instrument called the Universal Declaration of Human Rights. They don’t even know what the United Nations is, and all this basic information. After he lost his lover, which was tragically heartbreaking, Myo He was offered a one-year fellowship to Columbia University in New York to study at the school of International Public Affairs. And it was there that really made Myo realize, “I wanna do something. I’ve gotta go back and educate people.” So, he came back and founded the HREIB. Its main purpose is to conduct workshops on human rights training, which he did for about 20 years. He went up and down the Thailand-Burma border, in ethnic areas, in the refugee camps. That was when he started to become involved with child rights, working with the migrant children, and former child soldiers. He used his creative background as an artist and dancer to form a theatre troupe with the kids. Later, when Burma started opening up, Myo was allowed to go back, and he founded another NGO in Burma called Equality Myanmar. 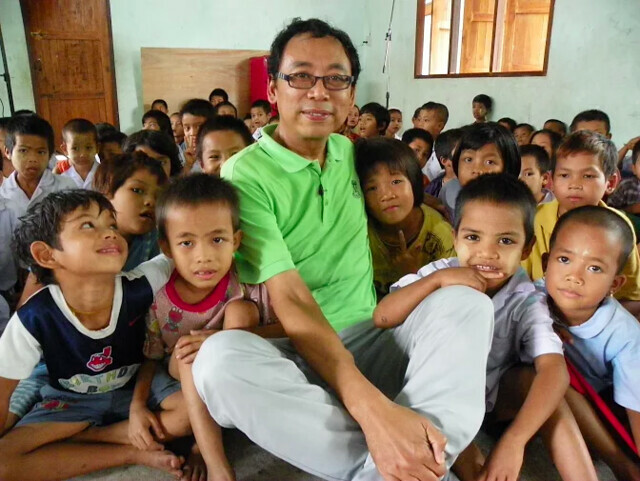 With Equality Myanmar, he continues to do human rights education workshops all over the country. But they’re also working at a campaign level too, to do advocacy on various issues. One of the key issues that they’re putting forward is LGBT rights, which are part of human rights. That’s the front and centre of Equality Myanmar but it’s not all that they do. They also do activities related to the student protests, the ethnic conflict, the things you saw on the film. But he is very much in demand, doing his training all over the country. He gets invited all over Burma to conduct this training. Yeah, he’s a great trainer. If you think he’s good in English, you should hear him in Burmese. He’s very passionate and tells a lot of jokes and he has people laughing, but he is also quite serious when he needs to be. He’s just one of the people who are gifted as a communicator and I think that’s why he’s so effective and why people love him. He also accepts everybody, since he’s an embracing and welcoming kind of person. He’s only been home for two years, but in that short time he’s become very popular in Burma. People see the way he works and how good he is. A lot of NGOs and civil society groups invite him to train their staff. Do you think it looks good for human rights in Myanmar in the near future? He’s not ignoring that there’s progress but he also can’t ignore the fact that there’re issues at the ground level like land grabbing, the fact that there’s still war in Kachin State, the fact that there’s terrible violence against Muslims and Rohingya. You can’t just pretend because you want things to be well and successful in Burma. So in many ways it’s also very risky for human rights defenders to come out on issues like that. Myo has been attacked very vehemently on social media, phone messages, text messages, attacking him, calling him a disgrace, and how dare he speak out for these illegal Bengalis and he’s a queer anyway and he’s not even real Burmese anyway because he’s a queer, a gay and there’re no gays in Burma! He’s been under a lot of personal attack. In the past he was an exile but now he’s in the country, he’s public and exposed to social media and mainstream media. So, I think he has a lot of courage to do what he’s doing, a lot of conviction. What can we, as Thais and fellows in ASEAN, do to help Myo in defending human rights? I think that Myo would very much welcome being part of some kind of network within the region. I don’t think it’s necessary that he ask for help only from Burma. He’s a part of the ASEAN Human Rights Forum that meets every year when there is an ASEAN summit. They have a parallel NGO meeting in the ASEAN Forum and Myo was a very active leader in that. I think that’s really where the future is. We would have people from the other ASEAN countries see what are the parallels, the common themes we’re all struggling against, and how we as civil society, as media, as human rights defenders, can collectively put these issues on a regional level within ASEAN. ASEAN is supposed to have this mechanism, this charter in the ASEAN Human Rights Commission. It’s supposed to have this charter that they unfurled under Ajarn Surin Pitsuwan. But that charter has never had any teeth or had any real effect with the ASEAN Human Rights Commission. I think that the use of this mechanism would be something Myo would really welcome. It’s not just for supporting Burma but for us as regional civil society groups to bring to the attention of our regional leaders that the times are changing and people in the country want democracy. They want a more just society. People are tired of the same old tunes that have been ruling this region for almost half a century. Not just in Burma, but also in Thailand and Cambodia, we face challenges like the lack of freedom of expression, endemic corruption, and the political machinery in place that doesn’t really give space for alternative voices. This has to change, because the hunger is there, and now is the time to change it. I’ve been in the region for quite a long time and I’ve seen this hunger evolve. I think there’s a real will, interest, and enthusiasm for change. I’m still hopeful because I think there’s a lot of people with great talent and spirit in the region who are willing to take the risks necessary to try to make those changes. Yeah, and like Prachatai, as well as other media and people willing to speak out in protest against military rule in Thailand. Speaking out shouldn’t be a criminal act. It is the act of people speaking on behalf of society to try to make things better. There’s nothing criminal in that. In fact, it’s altruistic. It’s something people should applaud, that someone’s willing to stand up for others, to stand up for truth, justice, and treating people with humanity, compassion, and openness so that people don’t live in fear. And that’s what everybody wants, isn’t it?